Coconut milk, curry, cumin and other Indian spices really compliment the flavor of the butternut squash in this savory soup. This may be my new favorite way to eat butternut squash. Even my husband, who is not a fan of squash, requested a second bowl. And speaking of bowls, isn’t this pumpkin bowl adorable? I got this at Pier One, what a perfect setting for Thanksgiving! Olga from Mango and Tomato inspired me to make this soup. I modified it using ingredients I had on hand, and made my curry with Indian spices my friend Tricia picked up for me in a West Indian store. 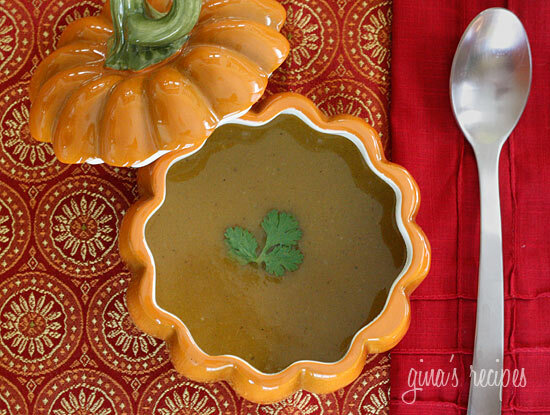 This would also taste great with pumpkin or acorn squash. For a thicker soup, use more squash, or less broth. I cheated and used a bag of cut and peeled butternut squash to save time. This took less than twenty minutes from start to tummy. 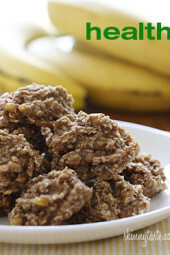 Gluten free, low fat, vegan, high fiber, this recipe satisfies many different diet restrictions. Add oil to a large soup pot or Dutch oven over medium heat. When oil is hot add onion, garlic and sauté. and mix well cooking another minute. Add broth, light coconut milk, butternut squash and cook covered until squash is soft, 12-15 minutes. , puree soup until smooth. Season with salt and fresh pepper and serve with fresh cilantro. Delicious, and such a nice twist to what I usually find to be a pretty bland flavor (butternut squash). My modifications: 1. I dumped all ingredients (minus the oil, because I forgot) into a slow cooker. Cooked on low for about 4 hours. Blended with an immersion blender in the crock pot. Absolutely delicious! 2. Added 1tsp ground ginger, 1 tsp dried mint and 1-2 tsp of acid (I used rice vinegar; it’s what I had handy). I probably had about 1.25lbs of squash in mine. 3. I didn’t sauté the onions first but the soup might be more delicious if the squash was roasted and the onions were sautéed first. ?4. The lack of oil wasn’t missed at all – and, yay!, less points. 5. I used regular vegetable broth. I didn’t have fat free on hand. So tasty and my house smelled delicious when I got back home. Will definitely make again. This is my favorite butternut squash recipe! I’ve tried quite a few others, and none compare. I’m sure it would be ok. This soup is wonderful! I am new to weight watchers and am experimenting with butternut squash. I loved the idea of adding the Indian flavors and am glad I gave it a try. The soup paired with sliced honeycrisp apple made for a great lunch combo. And all for just 2WW Smart Points! Am sending the link to this one to my sister who is on WW and has a diabetic husband. Good heavens, this is delicious. I didn’t have roasted cumin, so I put the regular ground cumin in a nonstick skillet and toasted it. I sliced my finger open trying to crack into the butternut squash, but it was totally worth it. This soup is phenomenal. I want to fill my bathtub with it and eat my way out. Does anyone else feel the need to use this soup as a curry base?? I am tempted to take half of the pot I made, throw a bunch of veggies and maybe tofu in it, and put it over some jasmine rice. Yummy! Oooo – the above comment sounds good! I'm making this right now, and my kitchen smells like an Indian restaurant. Soooooo good! Can't wait to tuck into this soup! Dude, gotta serve this over quinoa with sliced almonds and raisins on top. Delish! Mmmm looks delicious! Is this freezer friendly after making it? Extremely good! My five-year-old is eating some right now. I recommend a dollop of fat-free Greek yogurt (we used Fage). It adds a nice little tangy flavor to it. I have a butternut I've needed to use for some time…I think this is it! I'm really into my slow cooker these days (thanks for so many great recipes). Maybe someone posted in the comments already, but do you have suggestions on how to convert this recipe for slow cooking? My thoughts are to throw it all in, cook on low for 4-6. HI- any chance she got back to you on the slow cooker option? I am hoping to do this for a work lunch this week. Thanks! I have a slow cooker butternut on my site and it works fine. You can cook this low 8 hours. This came out amaZing! The only changes I made were to use pre-cut organic squash and I sauteed the squash with the onions, then added the liquid after 10min. After covering and letting it cook 15min, added all to my Vitamix. This made up for the disaster that I had with the LF Creamy mushroom soup last week. I will definitely be making this again!! I ended up using sweet potatoes because that's what I had. Delicious! I also added and extra tsp of the garam masala and the curry powder. I love it spicy! I recently found your site and this was the first thing I made. Can I just say. I am sooooo happy I found your site. It came out perfectly! Delicious! My husband loved it too. Melissa, it was a bit spicy for me too, so I went with a little bit of light sour cream to balance it. Help, I just made this soup. It is delicious but VERY SPICY! My mouth is on fire! Next time I'll go lite on the spice, but any ideas on how I can "cool" down the flavor of the batch I just made? Any recommendations for something to go with this soup? I am wanting to make a grilled white fish to accompany the soup and I am not sure what spices to use. Any help is appreciated! Garlic naan is so good on the side. Love your site and fantastic recipies, truly a gem! If I don't have garam marsala, how will the taste of this soup differ? Trying to decide to go shop for this spice if you feel its essential? Thanks! Slightly different taste but I'm sure it will be great! Love your site! Been following it for over year and have made many successful meals thanks to you. Question – I have a ton of Thai Red Curry Paste in the fridge, takes forever to use up – Could I use this as a substitute for the madras curry? It sounds like this is a pretty spicy hot soup. Is this recommended for someone who does not like spicy foods very much? This was amazing!! Added a can of chick peas, a dash of apple cider vinegar and both yellow summer (had it in freezer) and butternut squash – oh and a TB of brown sugar. YUM! The cilantro and green chiles definitely make the soup! Was wondering if plain greek yogurt on top might be yummy too! Loved it! Thanks! Made this soup yesterday and me and the kids were fighting over the last bowl! My neighbor is Indian and loaned me her fabulous fresh spices. The roasted cumin makes me never want the grocery store stuff again, and my neighbor mixed up the curry herself. This soup was so good, she came over and had me show her how to make it! Cilantro shouldn't be optional in this recipe! It really makes all of the flavors blend well. I also added 1 Tbsp of brown sugar and 2 tsp sriracha chili sauce for a little more burst of flavors. I couldn't find garam masala (nor have I ever heard of it), but it wasn't needed. Best soup I've ever made!! Fantastic! I have been known to be pretty upscale on my taste buds but I loved this! I ended up pureeing my cilantro in the soup too. I will be eating this for lunches next week but I am also freezing the rest of it since I made a double batch. Thanks so much for all your hard work on this site! So good. I did make change used 2 cups chicken broth and used pumpkin very hearty soup. Served it with a toasted baggette 1 tsp blue cheese sliced pear and honey drizzle. A dinner not soon to be forgotten. I am so glad I found this. As always gina this was out of this world! I added a touch of hot chili powder and a tiny dab of honey. Next time I might peel and saute an apple for a tiny bit of sweetness but this came out super good! Wow!! Don't know how I missed this one last year but can't wait to try it!! Was wondering if you could substitute pumpkin for the butternut squash – my very favorite soup is Vegan Apple Curry Pumpkin Soup from Whole Foods and this sounds VERY similar. Now that soup season is coming back around this is going to the top of my list :)! Just made your soup and had a bowl,fantastic! I had to improvise a bit,used regular cumin and had to use no fat sour cream because my coconut milk was more like a spread when I opened the can.Thanks I look forward to trying more recipes. Gotta go I need more soup! Aww, I was snow covered in Long Island! Your rendition sounds fantastic!! No need to respond to my earlier request, Gina. I had to make do w/what was in my cupboard anyway (I'm in snow-covered Brooklyn). I used the whole roasted cheese pumpkin, a cup of leftover spiced apple cider, a cup of chik stock, the whole can of lite coconut milk, a whole onion, a few cloves of garlic, sweet and madras curry powders, apple pie spice, cumin, a little brown sugar, sweet paprika, & some Sriracha. We adored it. I topped it w/some banana I sauteed in Pam w/a little brown sugar & the pumpkin's seeds I toasted in a skillet w/olive oil, cumin, & a pinch of brown sugar. Thanks so much for your inspiration. Your recipes are great b/c they can be adapted to whatever you have on hand. You are great! Gina, I just roasted a cheese pumpkin for this (I had to use it up) and wonder how much cooked squash the 16 oz of raw squash equals. I want to adjust the amounts accordingly. I think I've got about 1-2 cups of pureed pumpkin here. Thanks! Kathy, you're giving me some great ideas!! You'll love it, let me know what you think! This sounds lovely!! I can't wait to try it. Will try this recipe for Halloween! Thanks for this, Gina! I've bookmarked this to try soon. Also, LOVE the pumpkin serving bowl!!! Delicious! Bookmarking to make it! I've never had apples in soup, sounds interesting! Wendy- SO worth it!!! I have a recipe for chicken coconut curry on my site, it's excellent and a great recipe to use your garam masala. Just made this soup for dinner. It was deLISH!!! It took me a while to find a store with the Garam Masala … but it was SOOO worth looking for!! I will definitely be making this one again! YUMMO!! I made a similar soup curry butternut squash but instead of coconut milk it has 2 apples in it and some apple cider 1 cup. It has one more point per serving but is super delicious and has curry powder 2 tbsp and some broth, onions, instead of the coconut milk i like to garnish it with some apple too to make it pretty. P.S. I also added 2 carrots to my soup for a little extra bulk and sweetness. I made this as soon as it came in my email. It was so perfect…I lOVED it! Keep it up Gina! I love your recipes so much I shared your website with my WW meeting. Chum, they usually sell it in Indian neighborhoods. You could simply use ground cumin instead. Soupseeds, looks like you did a fine job at reducing the fat, was it good? Findingmyweigh/Niki, isn't it delicious!!! This is my kind of soup! Sara- I know, the bowl is so pretty! Gotta love Pier One! Unlikelyorigins, I love cumin too, you will love this if you are a cumin lover. I would *never* have come up with something like this on my own, but I'm intrigued! And, man, I love anything with cumin. Is it possible to be addicted to a spice? 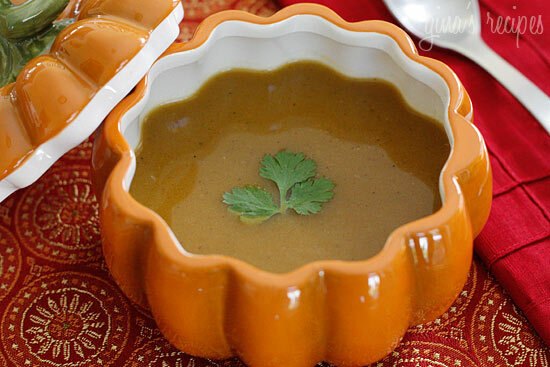 Besides the soup looking fantastic – I absolutely ADORE the pumpkin bowl! Wow … this is GREAT! I just made it tonight. I really dislike bland squash/pumpkin soup and this one is far from bland. Thanks for the great recipes! 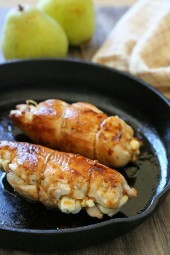 A similar recipe with carrots, also very tasty! This was DELICIOUS!! Perfect soup for a rainy Fall day when I'm nursing a cold. Thank you! Soupseeds, I've seen some yummy-looking chicken andouille sausage at the grocery store with all the different types of chicken sausages. Maybe you can try that too. 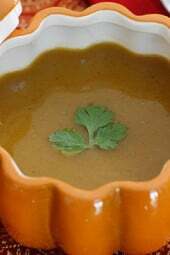 I tried adapting the Pumpkin, Barley and Sage soup myself, and lowered the fat by over 14 grams. Give me your opinion? 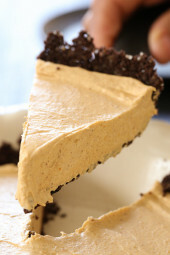 http://recipes.sparkpeople.com/recipe-detail.asp?recipe=1298899 Thanks Gina! You're my favorite "go-to" page for great recipes. I have a binder full of printed out recipes from your site. This looks fantastic! I'll definitely give it a try! I'm trying to adapt a soup recipe I saw in BH&G recently that looked delicious, using pumpkin, called Pumpkin, Barley, & Sage soup. It uses andouille sausage, but maybe to cut down on the calories/points I could use a few pieces of bacon, cooked and drained. http://www.bhg.com/recipe/soups/pumpkin-barley-and-sage-soup/ I absolutely love butternut squash soup, and yours are always delicious. Can't wait to try this one, thank you! I've never seen roasted cumin in the store. Do you make your own with cumin seeds that you toast in the skillet and then pulverize? Is the flavor markedly different? I can't wait to try this recipe. Yum. @Kaylyn, I love coconut curry! Regular cumin should be fine if you don't have roasted. Gina, is there a difference between cumin and roasted cumin? so proud of you 🙂 Great job. I do the same thing: use whatever ingredients I have on hand! Gina, this sounds fantastic! I've been craving coconut milk soups lately. Crossing fingers! If not, you can still make it without the cream. Or add low fat sour cream, I add that to all my soups that require cream. While typing I have some pumpkin soup on the stove. It calls for half and half, but mine went bad. I should have checked before starting to cook. So you are saving my dinner! Let me check if I have some coconut milk left. Thanks!